It's about as simple as, "If it glows, cut it out." And if a few malignant cells remain, they'll soon die. The findings, published in the journal Nanoscale ("Dendrimer-encapsulated naphthalocyanine as a single agent-based theranostic nanoplatform for near-infrared fluorescence imaging and combinatorial anticancer phototherapy"), have shown remarkable success in laboratory animals. The concept should allow more accurate surgical removal of solid tumors at the same time it eradicates any remaining cancer cells. In laboratory tests, it completely prevented cancer recurrence after phototherapy. Technology such as this, scientists said, may have a promising future in the identification and surgical removal of malignant tumors, as well as using near-infrared light therapies that can kill remaining cancer cells, both by mild heating of them and generating reactive oxygen species that can also kill them. "This is kind of a double attack that could significantly improve the success of cancer surgeries," said Oleh Taratula, an assistant professor in the OSU College of Pharmacy. "With this approach, cancerous cells and tumors will literally glow and fluoresce when exposed to near-infrared light, giving the surgeon a precise guide about what to remove," Taratula said. "That same light will activate compounds in the cancer cells that will kill any malignant cells that remain. It's an exciting new approach to help surgery succeed." The work is based on the use of a known compound called naphthalocyanine, which has some unusual properties when exposed to near-infrared light. It can make a cell glow as a guide to surgeons; heat the cell to kill it; and produce reactive oxygen species that can also kill it. And by adjusting the intensity of the light, the action of the compound can be controlled and optimized to kill just the tumor and cancer cells. This research was done with ovarian cancer cells. However, naphthalocyanine isn't water soluble and also tends to clump up, or aggregate, inside the body, in the process losing its ability to makes cells glow and generate reactive oxygen species. This also makes it difficult or impossible to find its way through the circulatory system and take up residence only in cancer cells. OSU experts overcame these problems by use of a special water-soluble polymer, called a dendrimer, which allows the napthalocyanine to hide within a molecule that will attach specifically to cancer cells, and not healthy tissue. 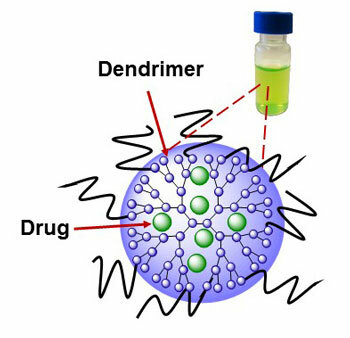 The dendrimer, an extremely tiny nanoparticle, takes advantage of certain physical characteristics that blood vessels leading to cancer cells have, but healthy ones do not. It will slip easily into a tumor but largely spare any healthy tissue. Once in place, and exposed to the type of light needed, the cancer cells then will glow - creating a biological road map for a surgeon to follow in identifying what tissues to remove and what to leave. At the same time, a few minutes of this light exposure activate the naphthalocyanine to kill any remaining cells. This one-two punch of surgery and a nontoxic, combinatorial phototherapy holds significant promise, Taratula said. It's quite different from existing chemotherapies and radiotherapies. "For many cancers, surgery is a first choice of treatment," Taratula said. "In coming years we may have a tool to make that surgery more precise, effective and thorough than it's been before." Before attempting human clinical tests, OSU researchers hope to perfect the process and then collaborate with Shay Bracha, an assistant professor in the OSU College of Veterinary Medicine, to test it on live dogs that have malignant tumors. The technique has already been shown successful in laboratory mice. Worth noting, the researchers said, is that even as phototherapy was destroying their malignant tumors, the mice showed no apparent side effects and the animals lost no weight. Systems with technology similar to this are also being tested by other researchers, but some of them require several imaging and therapeutic agents, repeated irradiation and two lasers. This increases cost, may lessen effectiveness and increase risk of side effects, OSU researchers said in their report.